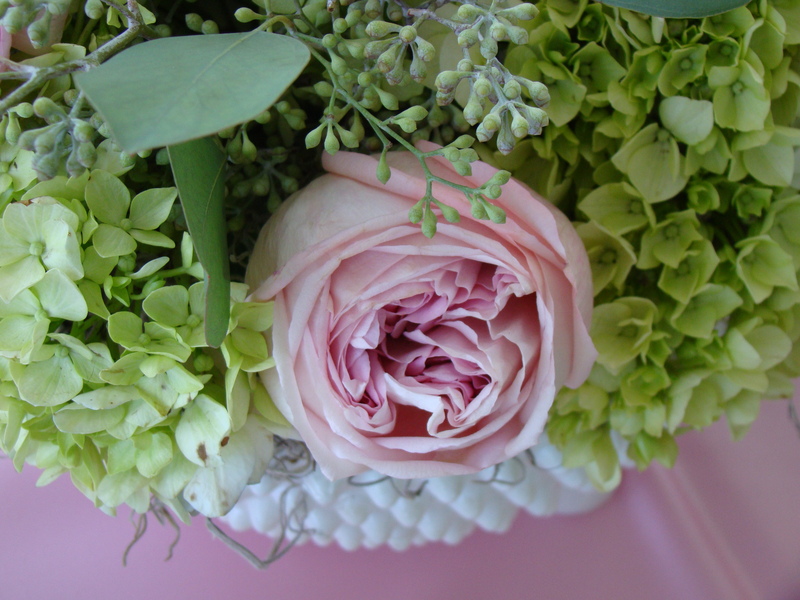 B. approached Pockets Filled with Posies to help her shower her niece with love at her “Bridal Shower Tea.” The colors chosen were pinks and apple green. The shower was held in the party room of a condo in the heart of the Goldcoast with amazing views of the city and lake. B. was interested in a soft, feminine, classic and vintage vibe, and was planning on using a family heirloom silver tea set as a showpiece for the celebration. Once A. and P. heard the words vintage and feminine- they knew immediately what they would use- their vintage milk glass collection! Special thanks to Maureen West of Maureen West Catering for introducing B. to Pockets Filled With Posies! Vintage milk glass mixed with soft pink hues and green creates a feminine “Bridal Shower Tea” floral story board. This entry was posted in General and tagged belles of ireland, bridal, bridal shower, dusty miller, girly, milk glass, Moss, pink and white garden roses, pink rennaculas and green hypericum berries, pink spray roses, seeded eucalyptus, vintage, white dhalia's.